Coming to the Bog to enjoy some birding? Consider installing the free Minnesota Birding News App on your smartphone or tablet. The app is available for IOS and Android devices and will keep you informed about everything from “the latest rare birds seen in Minnesota” to “blogs focused upon Minnesota birding”. The Friends of Sax-Zim Bog is the formal sponsor of the app, and it was developed by one of Friends’ volunteer naturalists, Rich Hoeg. An Android tablet screenshot is shown below. 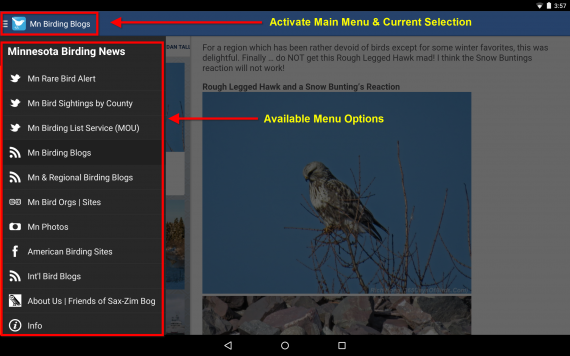 To install on your device log in to either Apple iTunes or Google Play and search on “Minnesota Birding News”, or visit Rich Hoeg’s blog which has an extensive app content description, more screenshots, and direct install links. Rich’s blog also has information about two other free apps he developed as donations to our region which may help you enjoy your visit, Duluth Mn and Lake Superior (more information).